Every Raptors fan has probably taken a look at the team's depth chart a few times and thought to themselves - “man, I thought this team was deep last season, but this season it’s as deep as Lowry’s love for DeRozan!” As a Raptors fan, it feels like you’re a contestant on The Bachelorette and have no choice but to fall in love with this gem of a roster. Just like the Bachelorette, people might be questioning the depth of the contestants (point-guard position) and you wouldn't be wrong for questioning it. Depth is something that could really impact one of the 4 points guards' minutes in a serious way. Kyle Lowry, Fred Van Fleet, Delon Wright and Lorenzo Brown are your PG’s and the initial thought is Brown will barely play and have less of an impact. I would question that notion right away and say to you, this is what Brown can do for you! 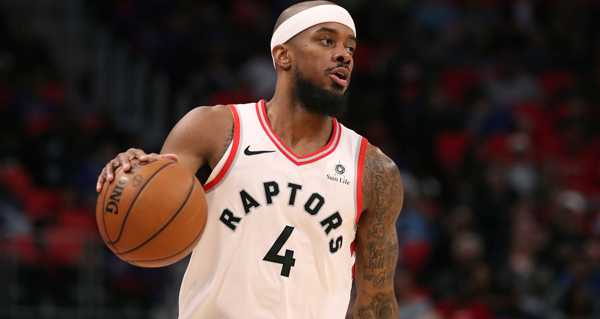 Lorenzo comes into the 2018-2019 season as the 4th string PG and basketball experts are wondering if he’s ever going to get on the court and make a meaningful contribution to the Raptors' endeavors. There’s a reason the Raptors signed the 6’5 point-guard from Roswell, New Mexico; they have a plan for him that requires him to be ready when called upon. Speculation is key in this situation but I strongly believe there is a lot in store for the dynamic guard for this upcoming season because he can absolutely hoop with the best of them. Brown will play a significant role, but with minimal minutes. Looking at the depth chart, there isn’t a lot of minutes to be given out for a role player like Brown, but he can still find a way to make an impact when given the opportunity. Last year versus the Orlando Magic, the Raptors had nothing going for them until Lorenzo “the Menace “Brown came in and brought the defensive intensity which resembled a young Tony Green. He had some strong defensive stretches and was able to score a couple key buckets while finding open looks for other players. Every player was struggling that night, but he found a way to get players much needed confidence building buckets. He single-handedly brought the Raptors back and led them to that victory. Yes, at that point of the season, a win wasn’t that dire, but it shows that when you give a young and success-hungry player an opportunity, he’s going to take it and run with it. That night’s performance may not earn him a key spot in the rotation, but his G-League numbers speak volumes to how he can impact a team’s chance to win the game when he’s inserted. Brown's performance in the G-league during the 2017-2018 season alone, earned him a spot on an NBA roster. Like Shakira’s hips, his stats didn't lie. Brown ended the season with an 18.8 ppg, 5.2rb, 8.ast stat line and those numbers earned him the honor of becoming the G-League MVP. If you’re thinking “who cares about a G-League MVP honor? It’s the G-league and that doesn’t mean a thing!”, then give your head a shake. Studs like Danny Green, Clint Capela , and Rudy Gobert emerged from the G-League and have made a name for themselves in the NBA. Overall, most players in the G-League must battle for an opportunity just to crack an NBA roster and face an even bigger challenge to stay there. For Lorenzo to nab the MVP honor is outstanding and it’s an accolade that shouldn’t be taken lightly. The G-Leagues MVP shot a whopping 50.5% from within the 3-point arc and 33% from beyond the arc, which totaled to a stellar 46.8% overall shooting percentage. His 3- point shooting isn’t something to marvel over and he’s no Jesus Shuttlesworth, but who really is? The Raptors coaching staff see a player that isn’t afraid to launch the deep ball when given an open look and he’s not afraid to chuck it at an efficient rate. Brown roughly attempts 4 three-pointers a game and makes approximately 1. Like I said, it’s nothing to drool over. But when he’s on the floor with the Raptors, he’s going to have a lot more open looks from beyond the arc. The Raptors were launching 3's like they were beads at Mardi Gras, but they weren't shooting them at a real efficient rate - only making 35.8% of their shots from beyond the arc. Brown is around that mark, and if he continues to work on his craft he should be able to get that percentage up which will only help the Raptors in their run towards a title. The Raptors motto is shoot first, ask questions later. They, as a team, need to improve their long-range shooting. With the additions of Leonard and Green (prolific 3-point shooters) should free up some open looks for players like Brown. Brown has a high basketball IQ and he will use his assist trait to find an even better shot for the Raptors while on the floor. If you don't believe me, go watch some highlight tapes of his game and you'll see that he's smart and makes the right decisions. Such decisions got him this far and he’s about to turn more heads as the years go by. All in all, Brown will have to fight for minutes day in and day out, but that should not discourage him. Instead, it should motivate the hell out of him. He’s on a legitimate Eastern Conference squad and he gets to learn the game from one of the best point guards in the East - Kyle Lowry - and play alongside arguably one of the top 3 best players in the league - Kawhi Leonard. There’s minimal downside ahead for the 6’5 PG's situation, and if he accepts his role and buys into what the Raptors have planned for him, you’re going to see him flourish with the opportunity. Brown is going to turn some heads this season; not only Raptors fans' heads, but the league is about to be put on notice. Brown is here to stay and ready to show you what he can do for you!